Adventurers who want to take full advantage of Dartmouth might want to bring their passports: More than half the students study abroad before they graduate. And as demand for international learning grows, so does the list of Foreign Study (FSP), Language Study Abroad (LSA), and other programs spreading across the globe. 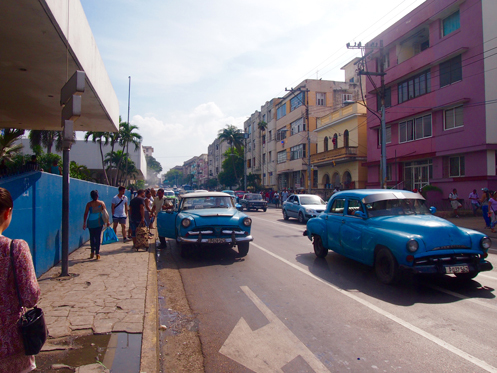 Pilar Brito ’16 took this photo in Havana during her fall-term Foreign Study Program in Cuba. One student who’s taken full advantage of the Frank J. Guarini Institute for International Education is Pilar Brito ’16. She’s studied French in Paris, art history in Rome, Asian and Middle Eastern studies in Morocco, and Cuban history and culture in Havana. In fact, Brito, who describes herself as “a military brat,” chose Dartmouth for its wide array of international study programs. She serves as a student adviser for the institute. When Dartmouth launched the first exchange with Cuba this past fall, Brito jumped at the chance to take courses taught in Spanish, which she speaks fluently. She also had a personal reason to participate in the first year of a breakthrough consortium for advanced studies program at the University of Havana and Casa de Las Americas, of which Dartmouth is a member. “My grandparents fled the Castro regime in 1968,” she says. “My dad was born in Nicaragua. Now he’s a Navy surgeon, and I have lived all over the place, but I had never been to Cuba." So the French studies major was eager to live and study in Havana and meet family members she has never known. A distant cousin living in Cuba is, like Brito's father, a doctor. But his standard of living is much different from the one her family enjoys in the United States. Before going to Cuba, Brito planned on a career in corporate law. Now she’s thinking of becoming a human rights attorney, in part because of her trip to the country her grandparents had left under duress. But even if she did not have those familial ties, she says, the Cuban exchange would have left indelible memories. That’s exactly the point of leaving campus for unfamiliar places, says Lynn Higgins, the Edward Tuck Professor of French and an adjunct professor in comparative literature and film studies. Higgins is serving in her final year as the Frank. J. Guarini Associate Dean of the Faculty for International studies and Interdisciplinary Programs. Her priorities have been to enhance existing programs, add new ones, and devise ways for students who cannot spend an entire term abroad to fit educational travel into their schedules. Those horizons are widening at Dartmouth. Enrollment in FSPs, LSAs, and other off-campus study programs has typically been between 500 and 550 students a year. Participation in 2015-16 swelled to nearly 600. Program directors attribute the growth in part to the addition of new locations, including London, Cuba, South Africa, Peru, Ghana, Japan, Morocco, and Jerusalem. But student travelers need not leave the United States to take their learning off campus. For example, a new domestic study program is based in Los Angeles, where immersion is in the film industry. Dartmouth is also partnering with the Institute of American Indian Arts in Santa Fe, N.M., to give students a window on contemporary Native American and Alaska Native arts. Art also lies at the heart of the newest Peruvian adventure. Spanish language study is hosted in Cuzco, and includes excursions to the Sacred Valley of the Incas, Machu Picchu, and Lake Titicaca, ending in Lima with a workshop led by a renowned theater collective. Higgins says Dartmouth prides itself on weaving foreign study into its own curriculum rather than merely sending students away to foreign institutions. Astronomers, for example, travel to the national observatory in Cape Town, South Africa, to observe the night sky in the southern hemisphere. Ayo Coly, Dartmouth faculty director of the first FSP offering in Accra, Ghana this fall, offered a course called “Narrative Africa.” Two others are taught by University of Ghana professors. Not so long ago, students most often opted to study abroad in Europe. These days, many are choosing more exotic destinations, says John Tansey, executive director of the Guarini Institute. In Rabat, Morocco, LSA students live in the old city with local families and take courses at the Cultural Center for Language and Training. Outside of classes, they take cooking lessons and calligraphy workshops. They also meet Moroccan novelists and filmmakers. At Waseda University in Tokyo, the focus is on contemporary issues related to the Asia Pacific region, such as international relations, health care, and environmental degradation. The Hebrew University Exchange, in Jerusalem, has students living on the stunning Mt. Scopus campus overlooking the Old City of Jerusalem as they study ancient cultures and modern tensions in the region. As an example, she cites Professor Diego Comin’s economics course, which enables students to see in Peru how one of the world’s fastest-growing economies is creating a deep divide between rich and poor. Students aren’t just observing that gap; some are trying to help close it. For example, Comin’s class is raising money to build a library, providing not just a reading room, but refuge in an impoverished section of Lima. Dartmouth students and faculty aren’t shrinking from the challenge of traveling in a post 9/11 world. There was a group in Paris when the city was attacked last fall. It was an unsettling time, but all are fine. The previous year, Dartmouth students witnessed fierce anti-government demonstrations in Bangkok. No matter where the program takes place, Higgins says, Dartmouth is “very vigilant to assure student safety and wellbeing.” College officials keep track of travel advisories from official sources, including the State Department, and do not hesitate to cancel a trip if the timing is not right. Tansey says that students and parents can be assured that foreign study programs at Dartmouth place the highest priority on safety. “We want travel to be enjoyable as well as educational,” he says. In fact, in some ways, he believes exploring the world is less dangerous than it used to be. “The improvements in transportation safety, availability of vaccinations, cleaner drinking water–all this has made study abroad measurably safer,” Tansey says. And with the Internet, cell service, and email, it’s also easier than ever before for student travelers to research where they are going and prepare for their journeys, while staying in touch with family after they land in their temporary homes away from home.